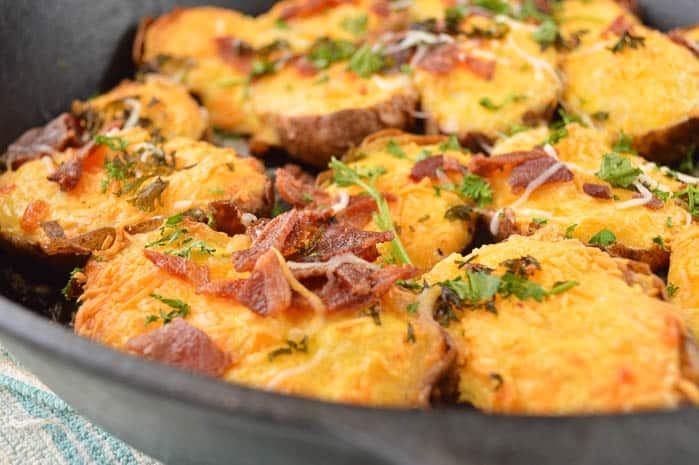 Twice Bakes Breakfast Potatoes are a GREAT way to use up leftover baked potatoes. Not just for dinner anymore! This classic appetizer recipe also makes a tasty breakfast or brunch. I’m not sure why, but I associate spring with brunch. This is silly because I would literally eat brunch every day of every week for all of my live long days. But something about spring and maybe all the holidays in it (Easter, Mother’s Day …) makes me feel like making and serving all the brunch-related things. Spring brunch is also a great excuse to make Meyer Lemon Mimosas. 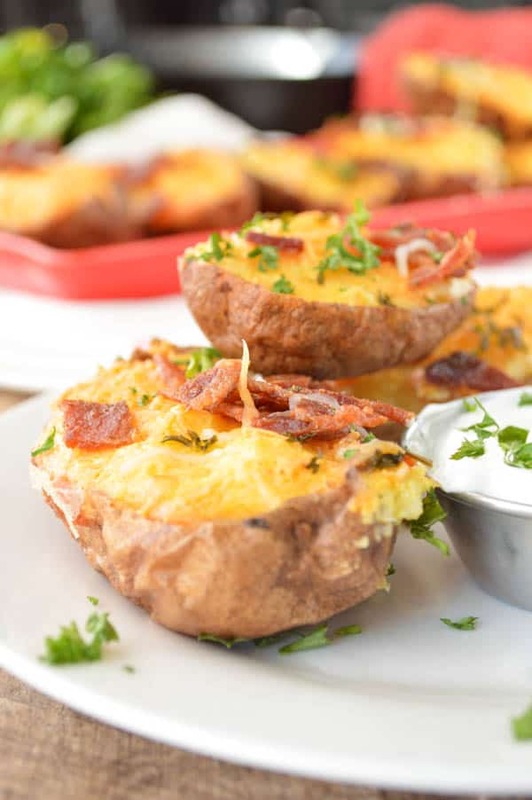 These Twice Baked Breakfast Potatoes have a lot of things going for them. You can make them with leftover baked potatoes. You can fill them full of basically anything you want. 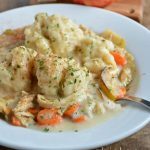 They are hearty and suuuper delicious. Are Potatoes Good for Breakfast? Uh … yes. 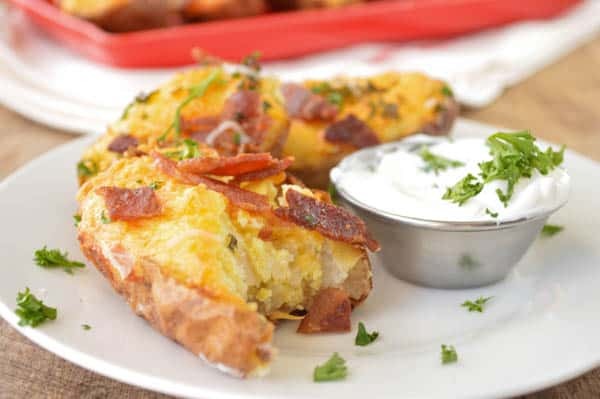 Hash browns and home fries are the status quo, but we are gonna elevate things here with Twice Baked Breakfast Potatoes. These are actually still great for dinner (brinner? are we still friends if I tell you how much I hate that made up word? ), and you can change up what’s IN them. Is bacon your jam? Cool. Prefer sausage (or have some thing else like country ham handy)? Also cool. Wanna go the veggie route and load these up with broccoli? I am here for it. 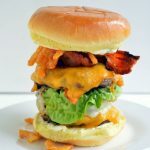 If you want to try a recipe with hash browns, I recommend Cheesy Hash Brown Breakfast Sliders. I put hash browns on burgers. Oh yes I did. 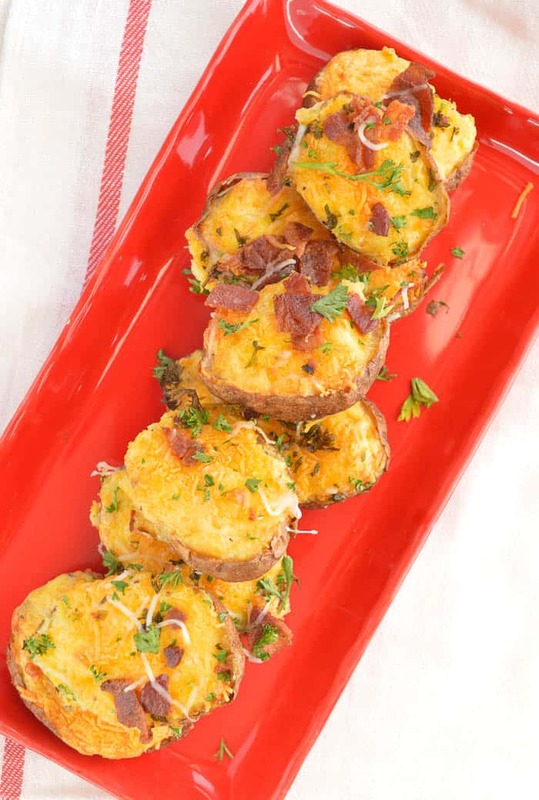 Can I Make Twice Baked Potatoes Ahead? Yes. In fact, I am gonna tell you to DEFINITELY bake the potatoes ahead of time. It’s a whole step out of the way. You can also go ahead and make the filling, and stuff these ahead of time as well. Just wrap tightly and refrigerate. I would not recommend making the filling TOO far ahead without baking it (the night before is probably as far as I would stretch that because of the eggs in the filling. TIP: When I make these ahead I use a metal baking dish because cold glass + hot oven = broken things. I also let the dish sit on the stove while the oven preheats for baking to bring the temperature up just a bit. Anyone that knows me knows that I am not a huge proponent of the microwave. That said though, I definitely bought one last year when Chad and I went to Memphis because teenage boys + a stove seemed like a bad call (#hotpockets4lyfe). I’m also REAL weird about microwaved pizza. Just … no. You can reheat these breakfast potatoes in the microwave, though. 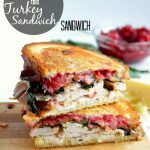 It doesn’t give a weird texture or ruin the goodness you started out with BEFORE you had all these leftovers. 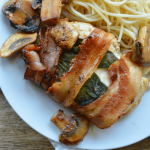 If you happen to be a bit of a purist like me when it comes to reheating things, you can also reheat these in the oven. Just put them in a baking dish and cover with foil. Preheat the oven to 400°F and give them a solid 15-20 minutes. 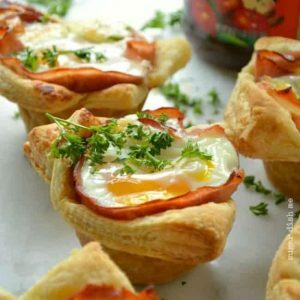 Ham and Egg Brunch Cups start with a puff pastry and get stuffed with a sweetly savory apple butter sauce, a whole egg, and sliced ham. Also I think they are just so pretty! 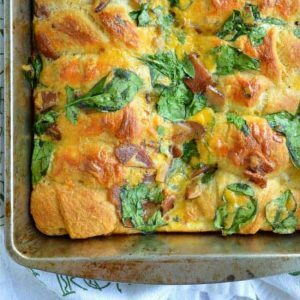 Crescent Roll Breakfast Bake is one of my very favorite ways to use refrigerated crescent rolls. Crazy easy, and another good one to make ahead. Croque Monsieur Rolls are one of those things you can put on a table and people literally ooooooh and ahhhhh over. 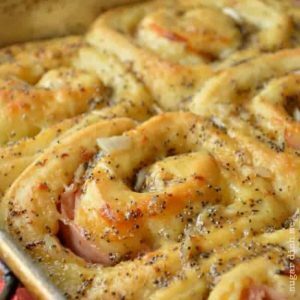 Brioche dough rolled up with ham, cheese, and loads of butter. AND they are easy. I promise. 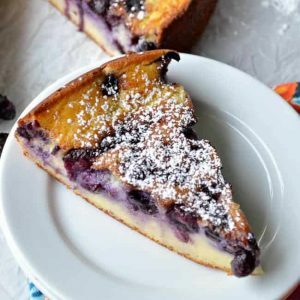 Blueberry Breakfast Cake is perfect when you want something a LITTLE sweet on your brunch table, but you don’t wanna go overboard with sugary sweetness. The texture is like custard. You’ll love it. OMG YES! I love me some twice-baked potatoes, girl! I’m definitely going to be stalking your site for recipes now. Hayyyyy thank so much, Trish!